I remember the first time I had a 'real' croissant. I was in university and we drove down to Boston from Montréal to visit my French (France) friend's folks. 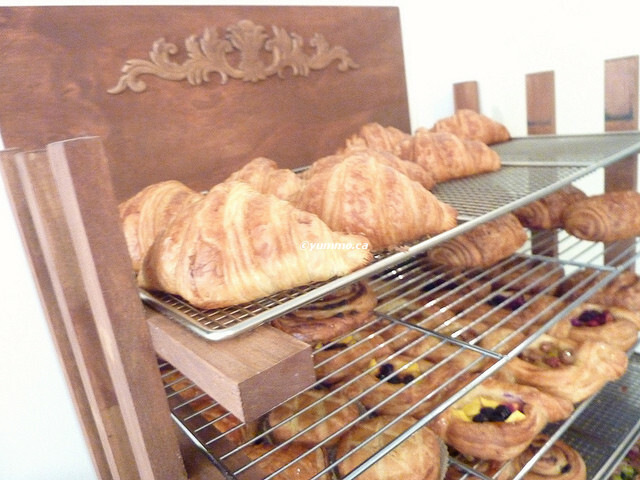 She bought a box of Croissants for her parents from a Belgian bakery near Park Avenue. Being French, she explained, she and her family are super particular about their Croissants. That bakery is the only place she's found that had truly authentic Croissants and her family agreed enough to have her bring them down whenever she visits. That, I assume, tells me that there was a similar dearth of REAL Croissants in Boston. Don't be so surprised. It's not easy. I mean even I'd only been exposed to supermarket or local generalist bakery Croissants. Think about good Bagels. I would still argue that you will not find a REAL bagel anywhere in Vancouver or Toronto. Solly's comes close but really Montreal and New York are where I stock up and freeze. Thus, I rarely buy Croissants or eat them in continental breakfast buffets. It's just disappointing. Occasionally if a bakery or patisserie smells right, I'll give it a go but have not found one blog-worthy, until now. When I moved to Bloor West recently, my cousin H came to help on moving day. There was little to do in the morning while the guys unloaded the furniture first. She decided to go for a coffee run for everyone. She came back with coffee for everyone, including the movers, how nice! For us, she brought back some savoury Croissant/Danish. One Spinach and Cheese and a Mushroom. I recognised the skill of a wonderfully flaky, buttery and flavourful pastry right away. The big fluffy ones from the supermarkets usually look great but lack that depth of flavour. The ones from Patisserie 27 on Jane were just gorgeous. On Sundays lil T wakes me up bright and early on the weekend despite my explaining to him that he should sleep in, his being a one year old, he refuses to cooperate. So rather than staying cooped up with him bored until the world wakes up, I take him for a stroll after his breakfast. I normally just have toast or cereal for breakfast except on weekends. This Sunday, all on my own, I decided to walk him down to Patisserie 27 and I arrived a tad early and found a couple of folks waiting outside the closed door. 7am and there's a line up. Wow. Just a couple of dudes looking for their Coffee and Pain au Chocolate fix. Understandable. Shortly after I ordered a mom popped in with her three kids for their breakfast. This was all before 8am. Glad I got there early. I ordered a Plain Croissant and an Almond. I loved their savoury but decided the best way to assess a good Patisserie is by their Plain Croissant and their Baguette. I get the Almond because, well actually I wanted their Chocolate Almond but they weren't ready. But I often get the Almond because my sister O is on a mission of her own. When she was studying Architecture in Montréal, a women ran a small coffee counter in their student lounge. She used to bring in baked goods from her neighbourhood patisserie. O was addicted to the Almond Croissants. She has been on a search for a comparable for over 10 years. I'll have to take her to Patisserie 27 when she visits next. I also ordered a coffee since I decided to keep walking while we were out anyway. Happily, they were brewing a new pot, I guess they brew themselves some while setting up for the day. She offered me fresh coffee without my having to ask. I sat in their modest dining area of two tables and munched on my Plain while I waited for my Coffee. I gave lil T a few bites which he ate with zeal. It was incredibly flaky and buttery. Baked on site, it was very fresh and reminded me of the dozen Croissant me and a friend devoured one morning while backpacking in the Loire Valley. We had popped out from our B&B for 1 quick pastry before setting off for the day. We ate 1 and immediately ordered 12 more. I could easily have done that today too. It was wonderful. The Almond I saved for later because I didn't want to lose any of the crunchy Almond's decorating the top to the sidewalk. It was equally flaky and buttery. 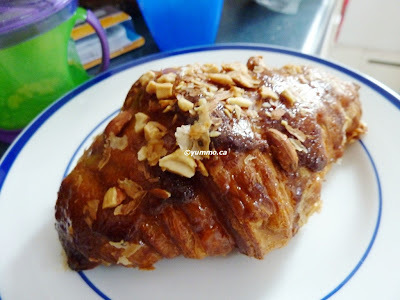 It had a light, light glaze which adhered the chopped Almonds to the top. The only thing I wasn't a fan of was that instead of baking the Marzipan filling inside, they slice them open and spread the filling inside. I only noticed when I started to pull it part. There's something to baking the filling with the Croissant. Yeah it makes the inside a bit more soggy but I love the aroma the Almond gives the pastry. Still, I will have to let my sister be the judge. 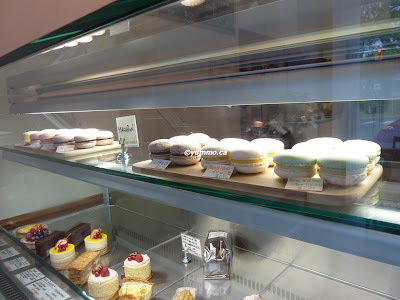 The Macaron called to me as I took the photos but maybe nextime. Even better than Thomas Haas Almond Croissants? ?